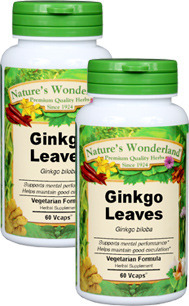 Ginkgo Capsules - 475 mg, 60 Vcaps™ each (Ginkgo biloba) - Penn Herb Co. Ltd.
As an addition to the diet, take 1 or 2 capsules, three times daily with water at mealtime. MAY POTENTIATE PHARMACEUTICAL MAO INHIBITORS. NOTE: Some herbalists recommend consulting your healthcare practitioner before use if you’re taking a blood-thinning medication.